As mentioned in my First Impressions post, I grabbed this game during one of those crazy Steam sales where you end up spending more money than you should, to buy more games that you'll never play. Well, I finally managed to complete this one! ENSLAVED: Odyssey to the West is Ninja Theory's (the same guys behind Heavenly Sword) take on the classical Chinese story "Journey to the West". Since the game is a sci-fi adventure set in a post-apocalyptic America, it's obviously very loosely based off the Chinese tale but curiosity got the better of me and I ended up playing it. So is the adaptation any good? How does the story hold up? Is the game any fun to play? Since this is an adaptation of "Journey to the West", you've got to have the main characters from the original tale, right? Well the Monkey King aka Sun Wukong, is now some muscular, acrobatic bikie dude who is nicknamed "Monkey", the monk Tripitaka is portrayed by a young woman who is a computer genius with the nickname "Trip" and Pigsy is some kind of engineer who looks very much like a pig. You play the role of Monkey and at the start of the game you and Trip are escaping a ship transporting slaves to a place known as "the Pyramid". 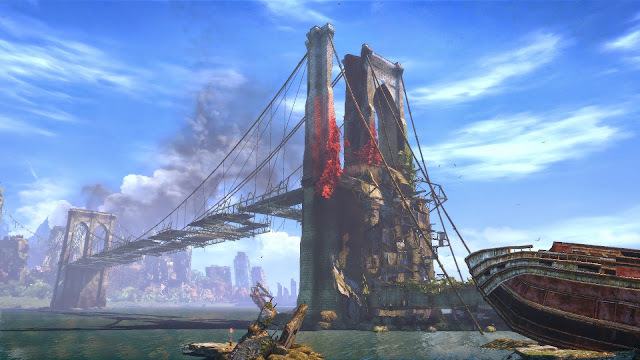 Both you and Trip manage to escape the slave ship which crashes into a post-apocalyptic New York City. Trip, who is distrustful of you, places one of the slave headbands on your head to ensure you follow her commands and are unable to kill her (without killing yourself). Trip needs your help in returning to her village and so begins the long trek to the west so she can be reunited with her father. While I'm by no means an expert on the original story, I think they've done a very good, albeit liberal adaptation of the source material. Magical items in the original tale are now cool pieces of technology (such as Monkey's staff and cloud). The scriptwriting is also very well done thanks to veteran scriptwriter Alex Garland (28 Days Later, Dredd, etc.) - it's actually not cringe-worthy which tends to be the case in 90% of games out there. Okay, there were a couple of cringe-worthy moments but at least they were intentional :). The only criticism I have about the story is that the ending leaves it open for a sequel which is exactly what the developers were hoping for, however the game didn't make enough profit in the eyes of the publisher and consequently, the plan for developing a sequel was canned. ENSLAVED is played from the third person perspective and has you attempting to complete jumping puzzles as well as fighting numerous hordes of mechs. The jumping puzzles are generally tolerable since it's more about timing instead of worrying whether you'll fall to your doom or not (which is usually the case in platformers). I did have some issues picking the right direction sometimes because it's probably not as easy to do with a mouse and keyboard setup than it is on console which brings me to one of the downsides of this game: it's a console port. All the controls in the game appear to be hard-coded (middle mouse button included which happens to be my TeamSpeak Push-to-Talk key) - and not only that but there doesn't seem to be any place you can easily look the controls up again if you've forgotten them (which tends to happen if you take a break from the game for a few weeks). Consequently, I had to resort to Google to jog my memory. Another issue I have with the game, not necessarily because it's a console game (although it tends to be more frequent in console games) are the awful camera angles. You usually only have limited control of the camera angle and consequently there will be many times during combat that the camera will be flying all over the place, making it difficult to focus on the action or realise which way you're facing with respect to the keys. I can appreciate controlling the camera angles might help them optimise the game (by only showing the player what they need to see) but the implementation in ENSLAVED felt really clumsy. Anyway, enough whingeing about console ports. I mentioned earlier that the game involves jumping puzzles and combat. I've already talked about the jumping puzzles so what about the combat? I actually quite enjoyed it and it can be quite satisfying once you've managed to time your moves correctly as well as learning which mechs are best to take out first. Some mechs can explode or send off EMP charges when you defeat them so these ones are usually quite handy to target first. You'll have to learn when to defend and when to counter-attack since you'll usually have very small windows of time for both. Monkey is actually pretty vulnerable if you don't get your timing right but the slo-mo finishing moves are a sight to behold. Monkey is voice acted by none other than Captain Gollum Haddock himself: Andy Serkis and he does a splendid job of it. Lindsey Shaw as Tripitaka and Richard Ridings as Pigsy also do well in their roles. While I don't find the music too memorable, it's definitely got a film quality soundtrack (thanks to Nitin Sawhney) which fits the cinematic feel this game has. I enjoyed the time I played with this game and the story definitely started to become more interesting once you've met Pigsy. Again you've got the usual Steam achievements that come with a Steam release, but sadly no trading cards. Since the PC version is the "Premium Edition" you also get an extra mode to play called Pigsy's Perfect 10. Besides that though, the game seems to be relatively well polished despite not being suited for the keyboard and mouse. While I am normally hesitant to recommend what is essentially a console port, ENSLAVED: Odyssey to the West does so many things right it would be a crime not to. The visuals are spectacular, the characters beautifully animated (or grotesquely, in the case of Pigsy), the voice acting top notch and the script is actually pretty good. Gameplay is generally good fun too although it's spoiled somewhat by annoying camera angles. Is it a good adaptation of "Journey to the West"? I'm no expert but despite it being a very liberal, post-apocalyptic take on the tale set in America, I think it is.